University alumnus David Logan (center) talks with John Boyer, Dean of the College (left), and President Zimmer (right) after Logan’s gift of $35 million to support the planned Center for Creative and Performing Arts was announced at a kick-off reception for the fifth annual Chicago Convenes. The new arts center, scheduled to open in 2011, will be named for Logan and his wife, Reva, who also attended the College. Last Thursday, May 3, the University announced it has received a $35 million cash gift from David and Reva Logan, and their sons and grandchildren, to support the University’s Center for the Creative and Performing Arts. David Logan, a graduate of the College and the University Law School, is a longtime supporter of the arts. President Zimmer sent an e-mail message to inform members of the University community about the good news. “The gift by the Logans will have a transformative effect on the arts at the University. The Reva and David Logan Center for Creative and Performing Arts, which is slated for opening in 2011, at an estimated cost of $100 million, will be a venue for the artistic expression and multidisciplinary inquiry, performance and production of our faculty and students,” wrote Zimmer in his May 3 note. The gift is one of the largest single donor gifts to the University in its history. It is also believed to be the single largest cash gift to the arts in the city of Chicago. The Reva and David Logan Center for Creative and Performing Arts will be located on the southern end of the University campus, at 60th Street and Ingleside Avenue; it will become a center for all areas of artistic expression, including visual arts, theater and performance, music and film. David Logan is a 1939 graduate of the College and a 1941 graduate of the Law School. Reva Logan also attended the College and is a former teacher. The Logans have a wide range of philanthropic interests—they have given generously to support education, health, social change and poverty reduction—but the lifelong Chicago residents have had a particular passion for the arts. 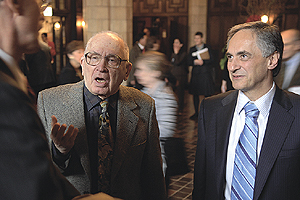 “The Logan family sees the center not as a building project,” said David Logan, “but as a way to improve the quality of life for students and faculty of the University, as well as the community.” Logan served on the Illinois Arts Council for 29 years and chaired the Council’s Arts in Education panel during its first several years. An internationally renowned collector of photography and artist-illustrated books, David Logan has received the Governor’s (Illinois) Special Recognition Award for Distinguished Service in the Arts and Education. In previous years, the Logans have provided generous grants in support of numerous arts projects, including New Writing in Photography, the Chicago Arts Partnership for Education, Ken Burns’ Jazz, and Duke University’s Jazz Loft Project. The couple also has funded the Reva and David Logan Collection of Illustrated Books at the Legion of Honor in San Francisco and has endowed a faculty position in investigative journalism at the University of California Berkeley’s Graduate School of Journalism. David Logan also has been a leader in Chicago’s alumni community. During a kick-off reception in Ida Noyes Hall for the University’s Chicago Convenes event Friday, May 4, David and Reva Logan’s son, Dan, spoke about the gift on behalf of his family. “The arts tell us who we are, they get us to think, inspire us,” he said. “My parents have always believed in the arts and believed that they should be accessible to everyone. We believe that the arts can change lives. An architect for the Reva and David Logan Center for the Creative and Performing Arts will be selected later this month. For more information on the arts at the University, please visit http://arts.uchicago.edu.